St. Patricks day! One of my favorite holidays. Weird I know, but my mom always made it a big deal, and we've continued on the tradition with our kids, so they love it and look forward to it too. I thought I'd share my favorite traditions of the day..
*the kids wake up to find tiny leprechaun feet dancing across the entire house. They must follow the tiny feet to find their treasure. I never leave out the Mister, some years his package is with the kids', some years it's at his office, last year it was waiting for him in his car. My mom did this for us every year, and just as we've continued on the morning tradition, we've continued on her evening tradition as well. The St. Patricks day dinner! Everything is green and the kids go crazy. They love it! We usually have corn beef and cabbage as the main coarse with green mashed potatoes, green bread, green salad, peas, grapes, green jell-o, green drink (this varies from year to year but the favorite is lime sherbet and sprite) and some kind of green dessert (this could include key-lime pie, green frosted sugar cookies or cupcakes, green donuts, etc). And of course what would the day be without wearing green? We always wear green. 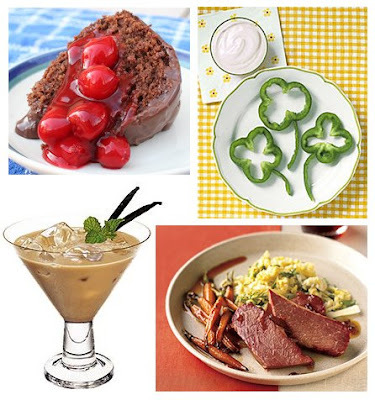 What are your favorite St. Patrick's Day traditions? What a fantastic idea! We always have green pancakes and orange juice, but this takes it to a whole new level! I just love this!! Growing up our good friends mom made a big deal about St Pattys day. She made green bread and made PB&J then cut them out in clover shapes! So fun!! I m going to start the tradition with my family as well! Thanks for the inspiration! I love your ideas! My children are making a Leprechaun trap in hopes of catching one! My birthday is the 18th so I've always loved St. Patrick's day too...plus my favorite color is green. My favorite is just wearing green, really. Heat oil in a large soup pot, add onions and garlic. Sauté until soft. Add all ingredients except for cabbage. SIMMER 15 minutes. Add cabbage and simmer additional 10 minutes or until vegetables are done. Taste and adjust seasonings, remove bay leaves. This can also be made in a crock pot. Serves 8-10 people. Horseradish could also be served on the side. Great served with rye bread. I LOVE this idea! I may start it next year since my little guy will be old enough to get it. And I love the idea of leaving a special something for the hubby in the car. When Brittany was young I used to cut out all the foot prints by hand. I got smarter as the children got older and bought a foot shaped punch. This allowed me to quickly punch out many matching green foot shapes. It makes leaving the trail quick work!